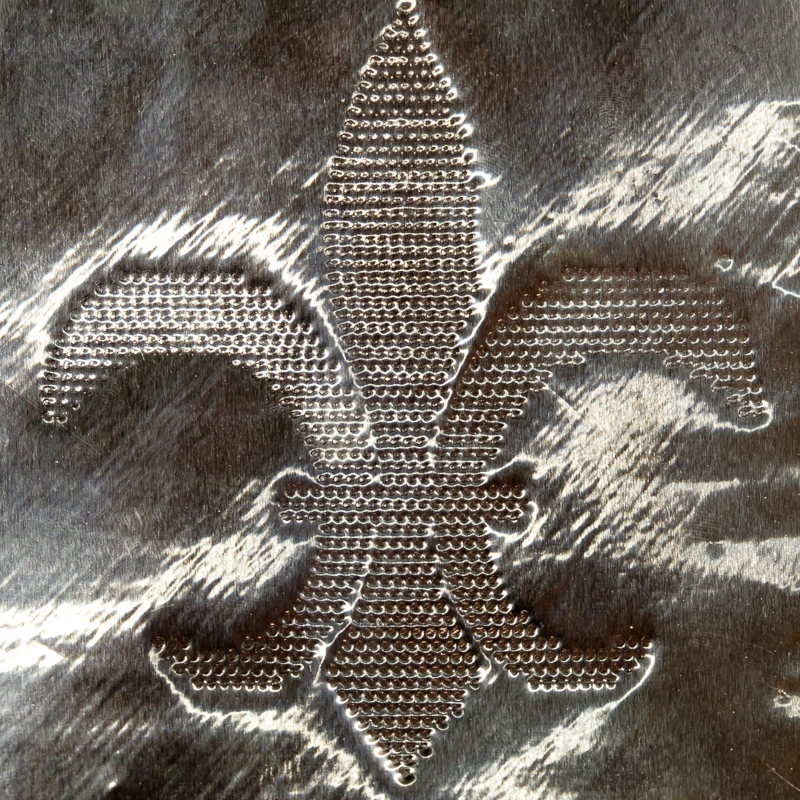 The KNK Force can exert a maximum pressure of 8.8lbs (the Silhouette Cameo only does 210 grams), so it can easily handle embossing a fleur-de-lis on 36gauge aluminum. Here’s a link to the original file and the rhinestone converted image I generated in Make the Cut so you can try at home! I am very interested in this new machine, but I do have a favour to ask. I have both Silhouette machines, and have been looking at another one that will cut mat board, but they all seem to have the same problem. None of them cut totally cleanly, i.e. they leave a tiny bit uncut at the last corner, which means you end up with a tag and not a clean cut. I am assuming this machine will cut mat board, which is 1/16 inch thick, so I would like to see a video of this machine cutting mat board, and you removing the cut out part from the main piece. It doesn’t have to be a very intricate design, just squares or rectangles. I just want to see if it cuts it cleanly without bits that end up tearing and leaving bits that need to be sanded off, or cut with scissors. Thanks for your comment, Marianne! I haven’t tried cutting photo mat material yet, but this photo shows a piece of photo mat cut using the rotary tool, but I’m not sure whether it’s cheap stuff or higher quality museum board. One thing to bear in mind is that photo mat comes in different grades that use different core materials. It’s often cotton or cellulose and the length of the fibers can determine whether or not some sanding might be necessary. If you’ve got a specific material that you use and would be up for sending a sample to me, I’d be happy to attempt a few different cuts with the various blades and the rotary tool to see which works best. Otherwise, I have to run to the store in a little bit to pick up some contact paper and I’ll see what I can find there and let you know! the mat board I am using is the cheap stuff you can get at Michaels, comes in large sheets. i mainly make miniatures (1/12 scale doll house stuff) like what Kris makes here: http://1inchminisbykris.blogspot.ca/. I have been using the Cameo, but since it doesn’t cut anything much heavier than 300gsm paper, I need to cut several layers and gluing them together to get the thickness I need. I recently got the Curio cause I was under the impression it would cut thicker material, up to 2mm, which means it should cut mat board, but it doesn’t have the force to cut it. Which is the reason I am looking at other machines to see if they would work. So if you could get just some cheap mat board and cut it, it would be great. since I am in Canada, it would take quite a while for me to send you some. The only video I have seen so far of a machine cutting mat board is for the silver bullet, but I saw that it didn’t cut very cleanly. The Force definitely has the force *grin* because it can also cut closed-cell PVC foamboard and thicker materials via the rotary tool. I believe the pinch wheels can accommodate material up to 6mm (1/4″) thickness, so the notion of using it to do scratch models is kind of exciting. I’m off to Michael’s to use my 40% off coupon and will report back! Marianne, I’ve gotten a few good cuts on the cheap photo mat from Michael’s but am trying to dial in the best settings before making a video. I didn’t have to use the rotary tool either! Stay tuned! Ah, that sounds great. Really want to see how well this works. it will be a while before I can afford the machine, but then…it isn’t really released yet. I have a friend in Holland who is just as curious to see if it will work right.